In the evening a joined transfer from you hotel in Bangkok to the boat pier. You will board an original antique teakwood rice barge. Experience first-class Thai hospitality and delicious food from around Thailand in the comfort and tranquility of this luxury, open-air cruise. Let’s come along and explore the Siam culinary experience on water. You will enjoy amazing Thai food while cruising on the Chao Praya River. In the meantime you will have a spectacular view over Bangkok by night. 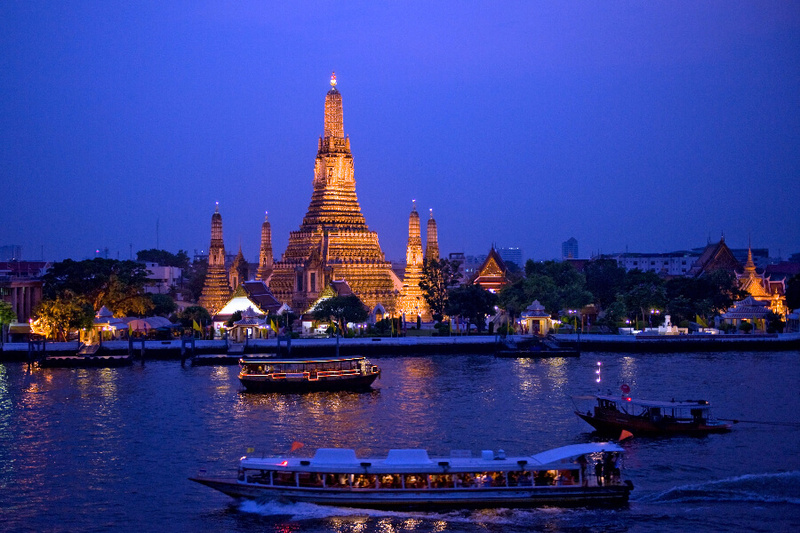 Drifting along the most historic section of the Chao Phraya River you pass a route such magnificent landmarks as the Temple of Dawn, the Temple of the Emerald Buddha, the Grand Palace and the display of the rayal barges. You will see some of the oldest buildings in Bangkok, including some dating to the earliest Portuguese settlements in the capital. Experience the bustle of river traffic and commerce in this vital artery that separates the old capital from the new. Afterwards a joined transfer to you hotel in Bangkok.